I just read a fantastic book called Algorithms to Live By: The Computer Science of Human Decisions, written by Brian Christian and Tom Griffiths. Many educators associate the word algorithm with computer coding and rarely talk about algorithms in any other context. Because an algorithm is just a sequence of steps used to solve a problem, they actually have applications far beyond the world of computer science. The authors of Algorithms to Live By, point out that the word "algorithm" comes from the name of a Persian mathematician al-Khwarizmi, author of a ninth-century book of techniques for doing mathematics by hand. They go on to explain that algorithms are not confined to mathematics alone, and offer several examples, such as following a recipe or knitting. A common methodology to solving problems that is used in maker education is the Design Thinking Process, which we have seen many iterations of. In addition to these processes, I wrote a post about a physics framework, called 'First Principles'. I would like to throw another problem solving process into the makerspace mix. In Algorithms to Live By, the authors explore an interdisciplinary way of thinking called human algorithm design, which essentially means searching for better solutions to the challenges people encounter every day. It gives us a new way of approaching and solving problems around us, and as the authors state, it gives us something even more profound: a new vocabulary for the world around us, and a chance to learn something truly new about ourselves. I am looking forward to putting this into practice as a piece of our 'Making the SDGs' project, which is focused on empowering and supporting students/youths in rural Nigeria to help to achieve the United Nations Sustainable Development Goals. As a part of this project, we will be putting our Hands-On Coding blocks into the hands of students there to help guide them through the human algorithm design process. It is our hope that applying the lens of computer science will help the youth of Nigeria tackle problems in their local communities and have impact on a large scale. 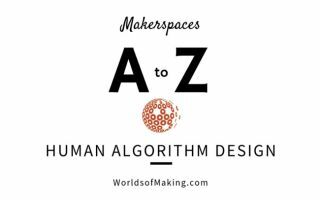 How will you provide opportunities in your makerspace for your students to think algorithmically about the world? Share your thoughts at #makerspacesAtoZ.